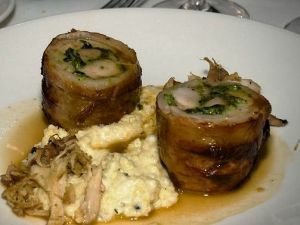 Stuffed Rabbit Saddle is a Portuguese food recipe with spinach and wine sauce. Season the rabbit saddles in salt and pepper, cut the onion in half, add it with the olive oil and white wine, and marinate for about four hours. Stuff the saddle with blood sausage and boiled carrot, wrap it and fry until the outside is crispy. Now transfer it into the oven to cook. Saute the spinach with chopped garlic, olive oil, salt and pepper. Make the sauce with the juice from the rabbit saddle, add the red wine and herbs for flavor, and then serve.